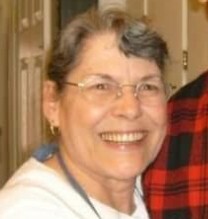 Georgia Mae George, loving mother, grandmother, and great-grandmother, passed away on Thursday, March 28, 2019. She was born on September 4, 1939 in Dixon, MO and married Jerold “Bud” George, on June 27, 1959. Together they had four children; Steven, Laura, Kathryn, and Mary. Georgia lived a full life being surrounded by the photographs, adventures, experiences and stories of her family. From sharing in photos of graduations, weddings, and the births of great-grandchildren, her and Jerold’s home was rarely without visitors. The door was always open, they were always welcoming and a glass of sweet tea, a good meal and laughter was always to be found. She had a warm and loving energy around her and shared it with all in her company. Georgia will be remembered for her countless talents, including quilting, baking her famous rolls and BBQ chicken, and making numerous jams, jellies, and pies. She enjoyed crossword puzzles in the morning with her husband, as well as gardening and sharing stories of her life. She is preceded in death by her grandson, Alex Lomeli; survived by her husband Jerold, her 4 children, 12 grandchildren, and 13 great-grandchildren. Georgia requested that in lieu of a service, that her family find comfort and love with one another. She will be greatly missed by all who knew and loved her. Thinking of you all during this time. Blessed Be.